Communique and Microsoft® have joined forces to provide advanced audio conferencing service that is fully integrated with Microsoft Lync Online (Office 365) or premise based Lync deployment. Communiqué Conferencing audio conference call integration enables you to easily integrate dial-in conference calling with Lync web conferences. We provide service to over 33,000 customers located throughout US, Canada, and EMEA. Risk Free: No contract, set up fee or monthly fee. 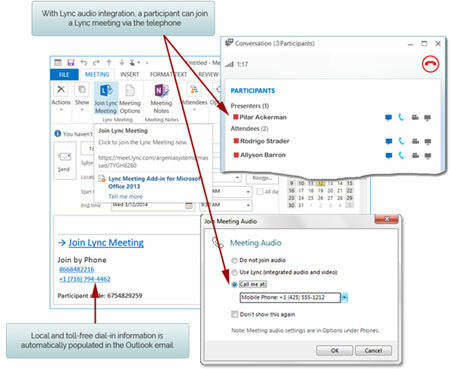 Full Lync dial-in conferencing integration: Connect Lync computer and dial-in telephone audio callers, Outlook e-mail integration, mute/unmute attendee lines, audio recording integration, real-time participant status, and more. Reliability and scalability: Redundant conference call facilities are distributed worldwide throughout seven (7) cities in the United States, three (3) cities in Canada, and six (6) cities international. The service scales up to 10,000 callers. 24/7/365 live customer service: It’s our commitment that the last thing any of our customers ever need to worry about is their conference calls. No matter if you’re a one-person shop or a global conglomerate, we do it all, including the worrying, for you. We assign a dedicated account manager and provide responsive 24x7x365 live support. Custom Branding: We can private brand your Lync audio conference call service to promote your company and build your brand as attendees join your calls. Click here to listen to a sample branded conference call prompt. Experience matters. Communique Conferencing is the global leader in conference calling. With 99.99% up time and 24x7x365 support, you can rely on us to for reliable, ultra-clear audio conference call service. For 14 years, Communique has been delivering reliable conferencing solutions to corporate, charity, education and government clients. Over 34,000 uses in over 35 countries trust Communique for their important conversations.